Original GIA report ships with ring. We also include comprehensive appraisal included free of charge. When looking at an emerald cut diamond I would never call it "Ideal" cut grade. Why? Well, each of these stones has it's own unique personality. Trying to categorize by numbers is really missing the point entirely. I loved this stone the first time I saw it, and live to look at it now. It is a gorgeous emerald cut with great life and a nice size for a carat and a quarter! SI1 - This is a completely eye clean diamond. The SI1 aspect affects the price, there's absolutely NO visual detraction. The GIA plot, shown directly below, gives you an Idea why the diamond is eye clean. Whatever faint imperfection there is, it in a place you can't see it- the corner. A beautiful and classic Emerald cut. G - faces up nothing but white. At 1.25 carats, it's a very desirable weight. Here's the story on this ring. 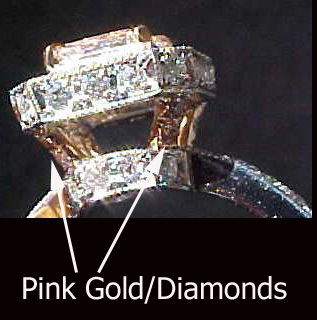 We originally made the ring for a pink diamond. We had another idea for the pink diamond, so this ring was available, what to do? As luck would have it, this 1.25carat Gorgeous Emerald Cut just fit right in. So much so that we did not even have to change the prongs. As luck would further have it, the pink accents have somehow managed to "infect" this perfectly pure white emerald cut- suddenly corrupted with a tinge of pink...excuse me. I'm not suggesting this is a "flaming pink" transformation- but there is certainly some pink highlights almost every time you look at it. Even the pink diamonds set into the four "uprights" add to this effect, I believe. The detail work on this super heavy platinum ring is sublime. From the delicate Mill Graining, to the diamonds that surround your entire finger. We use only well cut "melle" diamonds, of high color and clarity. 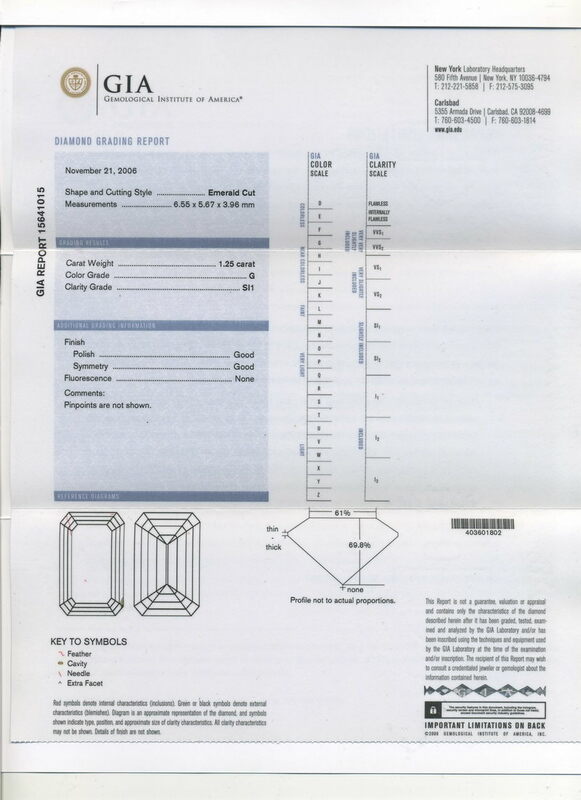 Lab Report This diamond comes with a full GIA report. We will also include our comprehensive appraisal for identification or insurance purposes. How much will my new diamond appraise for?